Let's be sure the demonstrations we recommend to fellow educators get the science right! places big challenges -- and duties -- on a presentation. The choice of energy source for a CO2 infrared absorption/heating demo is a big one. Are incandescent light bulbs a helpful recommendation? 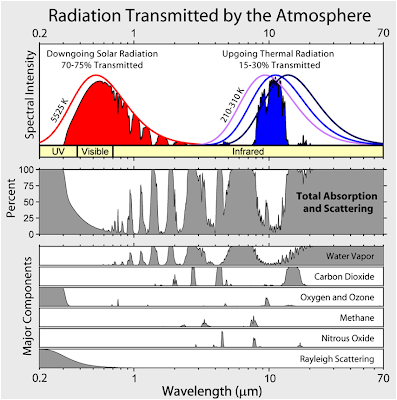 Energy spectrum of incoming light sources used in the demos -- light bulbs and sunlight: visible light and short wavelenth IR. These wavelengths pass right through carbon dioxide (except for a tiny sliver). No heating. from the sun, or a light bulb. Yes? Very little would be absorbed by CO2. CO2 or methane trap heat. American education has been flooded with recommendations to choose demos of the type using incandescent light bulbs. With heavy promotion, teachers are being directed to focus their time and resources on demos such as these for hands-on learning. is close to the same as incoming solar radiation. **Energy in those wavelengths pass though carbon dioxide, almost entirely. Those frequencies are not absorbed, except for tiny amounts. 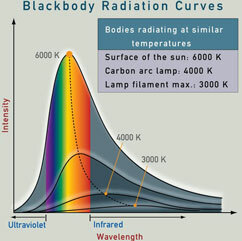 Solar radiation is in UV, visible light, and short wavelenth infrared. How are the demos being promoted which claim dramatic temperature differentials acheiving this with energy that CO2 essentially does not absorb? Doesn't this encourage you to attempt to demonstrate something that doesn't actually happen in the real world? Doesn't doing so only serve to confuse students (and their teacher)? i.e. not recognizing the difference of incoming compared to outgoing energy. Might this place you in the position of presenting bad science? Possibly to be left holding the stick: criticised, ridiculed or disciplined in the future. If done carefully, you would expect to NOT get a measurable temperature difference. Would that indicate that global warming and climate change are a fraud? You could still get significant, consistent temperature differentials, but you'd have to fake them. e.g. use improper lab techniques to force results. We science teachers should never fake our hands-on science demonstrations. Recommendations to do so are best avoided, no matter how much funding is being offered to cash starved schools (or museums). by absorbing infrared energy, more so than ordinary air. The curves to the left illustrate the wavelengths of light involved. i.e. their curves are shifted a little bit to the right of the sun's. thorough CO2 to make it measurably warmer. being misdirected? Isn't the signal we seek being drowned out? feature of how global warming and the greenhouse effect work. The intent is not for students to doubt and be confused. Right? In many of the demos, materials are included which may ostensibly be there for this purpose: rocks, soil, water, little earth globes or black paper. The conversion of light energy does happen, although often poorly misunderstood. However it is way, way too small for students to measure in these experiments. Where the impression is that this is being demonstrated, confusion is being generated. This can feed doubt and mistrust in basic science, including climate science. If the honest intent were to demonstrate this particular sequence, wouldn't it be better to use fluorescent lamps? Better still, white color LED lamps. These are very effective in producing visible light, with little infrared. By all means, please try it yourself. Yet doing this, demos would be duller than watching paint dry. Nothing would happen. There would be essentially no temperature rise to measure of any sort. No matter what is the intended to be demonstrated, shouldn't the presenter provide interpretation of what they claim is happening? When reviewing demo scripts, note how rarely this is done. Science demonstrations should never create the illusion that something is observably happening in a demo, when it is not. but a failure of the particular demonstration or experiment. Such failures should not be recommended for science teachers across America to repeat. by solid and liquids. This energy is then re-radiated at longer wavelengths, which then are absorbed by CO2. None of the demonstrations or experiments, that we are reviewing but not recommending in this special section, actually do this, in our findings. To successfully and authentically produce measurable readings requires demonstrations of this style that are far more difficult and complex to build and present. There are many other demos where students and the public can accurately, authentically and with great joy experience and explore every step hands-on. Yet, in faulty demonstrations like these, the signal is far too small to measure with school lab equipment, and/or is being drowned out by noise. It is not genuine, we feel, for the reviewed demos to continue to give the impression that they demonstrate things, that they do not. In many of the demos reviewed here, materials are included which may ostensibly be there for this purpose: rocks, soil, water, little earth globes or black paper. 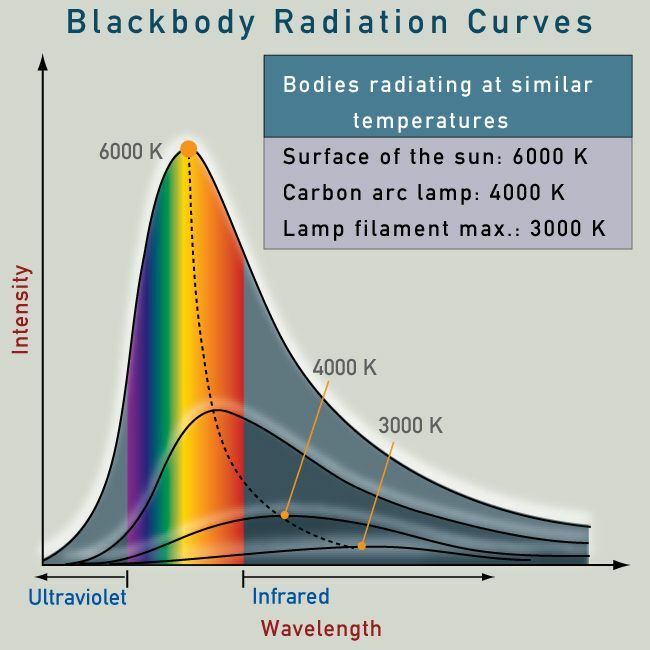 This sequence is more on track, if it were actually being demonstrated: the sun and incandescent light bulbs emit short wave infrared radiation (1-3 microns). Most everything on Earth's surface, both land and oceans -- including our bodies -- emits long wavelength infrared radiation (8-14 microns), or longer. Very roughly, objects in the 100 to 500 degrees Celsius range primarily emit mid wavelength IR (3-8 microns). Carbon dioxide primarily absorbs infrared in bands peaking at 4.26 microns and 14.99 microns. In the full scale, real Earth system, the 14.99 centered band is where the action most occurs. This is where serious planetary heating by infrared takes place. You need to know what you are doing to demonstrate scientifically and authentically that action on a table top. Science teachers can do this. Note: different fields of science, such as space studies and astronomy sometimes define the bands a bit differently. There is a multitude or reasons why the faulty demos do not produce measurable temperature differentials by this mechanism. How is the outgoing energy from the earth being represented? How do gas containment vessels influence the results? Properties of PETE plastic and glass in various infrared bands. Signal to noise ratio: how strong a signal is expected; against how much background noise? Would you expect to see a measurable signal? Accuracy and tolerance of test equipment available to educators. Modeling Earth's atmosphere, with its many layers. Outgoing energy to the cold of outer space. In any case, interpretation should be provided that indicates clearly what a demonstration even intends to show. Few of the demos give a feeling that it is long wavelength infrared energy that carbon dioxide is capable of absorbing, where warming occurs. This happens every minute of every day -- in the Earth's atmosphere, on Venus, inside industrial gas monitoring equipment, and literally right in front of our noses. The American public has been largely denied the opportunity to see and experiment with it; demonstrations that by design do not work keep people blindfolded. especially if you are trying show all the steps happening all mashed together all at the same time. Challenge 4 -- Light bulbs introduce vast amounts of noise; this is masking the faint signal students are looking for. the amount of warming caused by CO2 absorbing infrared in a small volume container in a few minutes, compared to plain air. It's a very cool thing to show, especially since this warming effect has been happening ever since Earth, Venus and Mars had atmospheres. Without this effect, there would be no fish, no trees, no cities or industry, no radio, no internet, and no people to argue over whether global warming is real or not. The effect can be measured; it can be demonstrated on a table top; but it isn't a snap of the fingers to do well. Somebody cranks up the stereo to volume 10. We're blasting the experiment with energy that is in the wrong wavelengths to bring to the surface the result we are looking for. High energy wavelengths. This is energy that heats up solid and liquid objects fast. Small variations in distance, angles and thicknesses make for big differences in temperatures. Essentially, we are introducing a huge amount of noise. Noise that drowns out the signal we are looking for. For those choosing to take this path with demos, it would be good to indicate to students the challenge that is being placed upon them. 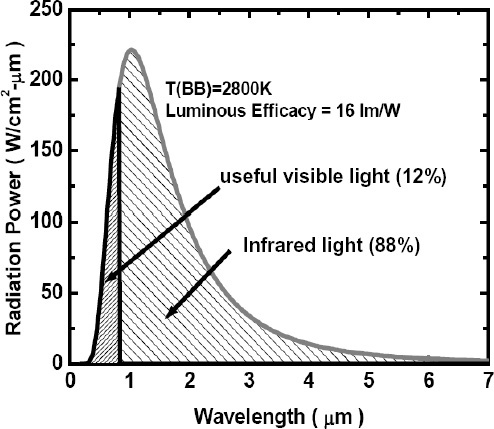 ourselves this over the years: "CO2 does absorb at least a tiny amount of the infrared portion of the light directly emitted by incandescent light bulbs, right?" Wouldn't it would be cool to have demos that can measure that?" have relevance to the radiative greenhouse effect. Would it really be that cool, given the trouble? Most of all: this really wouldn't be a demonstration of the radiative greenhouse effect or how global warming is happening. 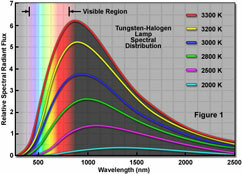 of the solar spectrum. 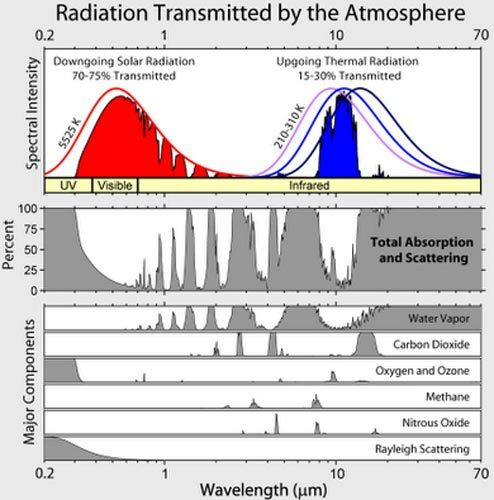 High in the upper layers of the atmosphere, gas atoms are blown to smithereens by high energy /frequency radiation. 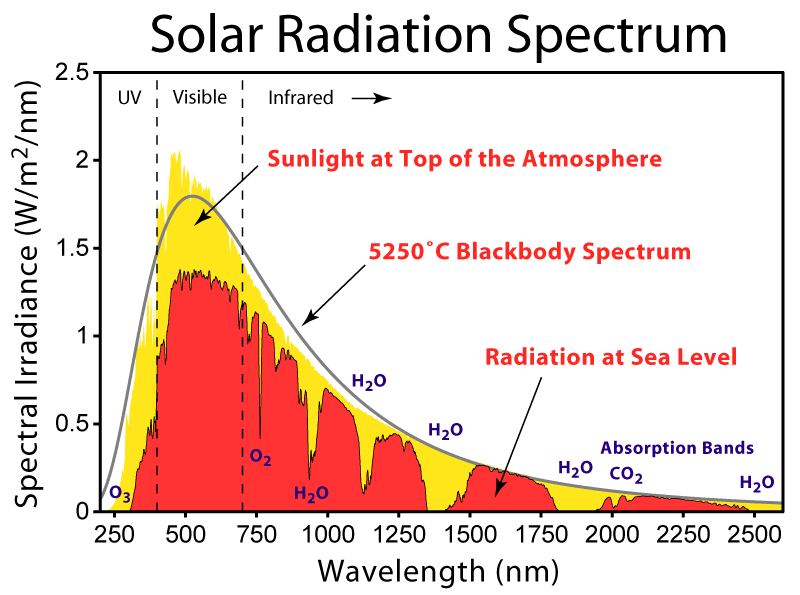 If water vapor and carbon dioxide only absorbed infrared light that comes in from the sun, there would be no radiative greenhouse effect. not the natural or the human caused warming of the planet. It would be of less value, and would potentially be deceptive to only focus on that part of the spectrum. It is carbon dioxide's, and the other greenhouse gases', ability to let sunlight enter, but absorb outgoing energy emitted by the Earth, that is what is being studied. Naturally, different people can and should develop different demonstrations as they choose -- focusing on various phenomena. and not the incoming energy from the sun that drives the radiative greenhouse effect. Challenge 6 -- It is a challenge to demonstrate something that is NOT happening at the same time revealing what IS happening. That is not an optional challenge, if we are to be scientifically accurate and clear. To be successful, we want to demonstrate CO2 warming up, having been heated by wavelengths of infrared that the Earth's surface emits. NOT significantly warmed by the direct incoming energy of the light bulb; just as one would expect theoretically; just as happens on the planetary full scale. None of the demonstration we reviewed do this -- from what we've read, in any presentations we have seen, or reports we have received. True demonstrations of the radiative greenhouse effect must be clear. or we are spreading confusion about the phenomena being explored. What is the light bulb doing there? What does it represent. What effect is it having? What effect is NOT having? How is that being demonstrated? This is fundamental to the subject. If we confuse this, are we truly demonstrating the greenhouse effect scientifically? How will I demonstrate that incoming energy from the sun is NOT absorbed by CO2? How will I demonstrate that CO2 DOES trap heat energy that is emitted by the Earth's surface? Shall I demonstrate these in separate steps, or all at the same time? If together, how will I do that? Are light bulbs the best source of energy to pull from my tool box for such a demonstration? Challenge 7 -- That demos like these have been promoted so heavily, but have not been widely questioned publically. What is being said about what light bulbs are doing? What are children learning about what they are NOT doing? What does this say about what is promoted in the schools, and what it not. Is hands-on science being promoted widely properly vetted? Subject to review, discussion and verification. crafting messaging by words and images, and at the same time devaluing hands-on science and actual experience in the testing evidence. a free for all for sponsors to promote what they please, and educational material not seriously reviewed, not treasured to be brought to the highest standards. This while billions of dollars have been spent debating matters around global warming and climate change. One can use these science demos as a test: Consider how Americans have reacted to them. We recommend: Ask people to interpret what is happening when they see one of these light bulb centered demos. the very basics of global warming and climate change science. The science which anyone can test hands-on, not that which only elite scientists have access to. That there is such lack of understanding over whether the greenhouse gases absorb incoming solar radiation, is one example. asking themselves: "How is this supposed to work? What is happening here? Does this fit with my understanding?" "Are kids being taught that it is a valid test to check if energy coming directly from the light bulb is heating the CO2 -- really?? " Is not a big part of why America is having such a hard time on climate change, the lack of quality hands-on science? -- experience with even the basic science. How can people take seriously that which they have little experience with, little involvement with, have not seen with their own eyes? We're very big on arguing about opinions & beliefs. How are we doing at testing what is real for ourselves? Are we giving kids the opportunity to test what is real? Shouldn't the American people have the opportunity to explore the evidence, verify what is true and what is not? Not just told what the are supposed to think. Most Americans have had no hands-on experience with even the very basics of climate change. Without that, how could they know what they are talking about? It is one thing to make a Powerpoint presentation, or a video, or sit in a radio studio talking about global warming, climate change, or the greenhouse effect. Anyone can claim anything they want in electronic media, in words and images. Fantasy can look so real. Is a factual claim true just because we say it is? The real test can be: -- But can you demonstrate it?! Lets put claims to the test. Let's do it all together in public, where tricks and fakery can be exposed. Verify the evidence. Isn't that real science? can be a valuable test of where we stand in science education. By all means, use them to survey people's understand and experience. It will be a challenge to move ahead, and break thru the obstacles in front of us, in doing great hands-on science. But who becomes a science teacher without loving to take on a challenge? What about the demonstration done on Mythbusters? We do enthusiastically recommend that teachers and students alike watch the Mythbusters episode: Testing global warming theory -- does CO2 warm air? "Please keep in mind: MythBusters is a science entertainment show. Educators need to go beyond, especially in interpretation of what happens in demo." The Mythbuster segment is very clear: this is a very challenging demo to do. Most of what Mythbusters does is of the "do NOT try this at home" variety. They often do what is too hard, expensive, unsafe...weird or embarrassing to do at home or school. This is a science entertainment show -- in many respects a great one, for testing scientifically popular themes and urban legends. compared to a science demonstration presented in a classroom or science museum. Interpretation is not given, for instance, about the full process at work. Professional studio incandescent lighting is used as the energy source. It is not discussed how the energy from the lights mainly passes right through the (well chosen) membranes and gases contained inside. and the gases in the CO2 and methane rich containers become slightly warmer than the control containers with regular air. Yes, it can be done! Way to go, Brandon! quality gas content monitoring by Los Gatos Research, carefully constructed controls, etc. Having Professor Kristie Boering as a science advisor! The faulty demos reviewed do not even come close to doing the necessary steps to get authentic results. Mythbusters reported a 1 degree Celsius differential temperature rise that held steady. By contrast, where do claims of 9 degrees Celsius of differential temperature rise come from? -- as in one of the demos reviewed. Why give students the impression that negative results they experience are an indication that warming doesn't really occur? There are lots of ways kids can have fun melting some Jamie's, and still get the science right. They need valid demos to do it. 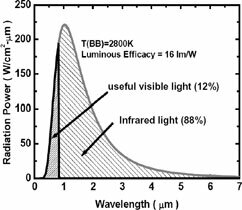 Note to colleagues involved in designing authentic strong demos: IR lamps indeed have attractive qualities -- low cost, widely available, producing longer wavelengths than ordinary incandescents. We've used them for over a decade very successfully for demos related to the frequencies in which they operate. Their spectrum sharply peaks in short wave IR. They are not so attractive for demos of the nature being discussed here. We are experimenting with filters which pass IR wavelengths in the 4-5 micron range, exploring designs that can bring the cost down and make these accessible. There are many challenges in taking this approach. Not sure if it is a good one. We can share experience with each other on this. For over ten years: we have been designing, developing and presenting hands-on science demonstrations for 100,000's of participants. Sharing experiences, mutual learning with science education programs worldwide.. If you are part of designing, teaching, presenting and/or supporting sound science hands-on demonstrations on climate change, perhaps we should be working together.